go shinboku, goshinboku, go-shinboku, go-shin-boku 御神木　"honorable sacred tree"
reiboku 霊木 divine tree, "tree with a divine soul"
. moriki 杜樹 tree of a shrine . Literally, "divine tree," a tree regarded as sacred, as the symbol of sacred territory or a place in which the kami dwell. When viewed in this way, the cutting or polluting of such trees is avoided. On the other hand, in some cases the term is used to denote the lumber dedicated for building shrines. During the Heian period, the sacred nature of certain trees was exploited for political ends, as when priests (jinin) of the Kasuga Shrine in Nara carried a sacred sakaki tree when making demands in Kyoto. 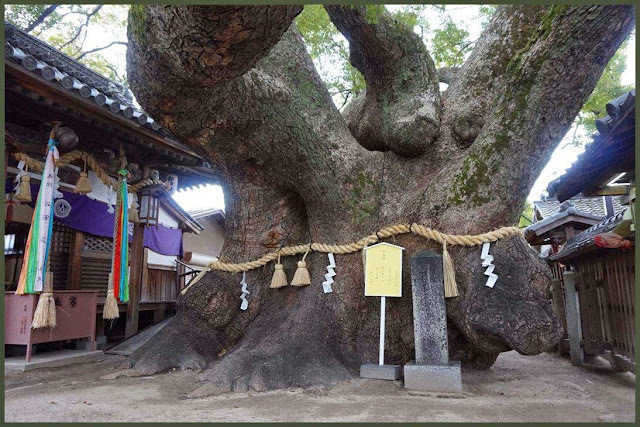 Since ancient times certain trees or entire groves within shrine precincts were regarded as sacred, as attested by expressions such as "the cryptomeria revered by the priest (hafuri or hōri) of Miwa," or "the sacred forest (kannabi)" (both expressions found in Man'yōshū), or from the records of Emperor Kōtoku in Nihongi, "he despised the way of the kami by felling the trees at the Ikukunitama Shrine." 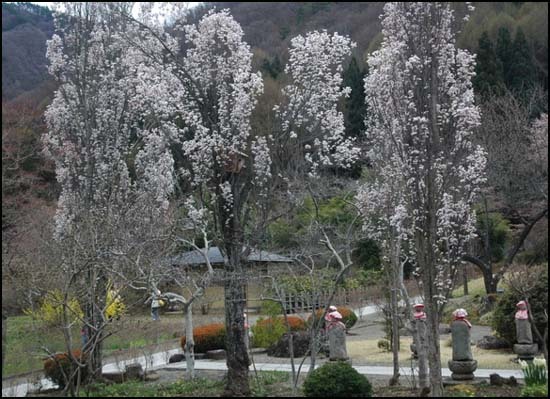 Sacred trees are seen frequently today, encircled by sacred border ropes (shimenawa) or enclosures. In most cases such trees represent very old or large specimens. 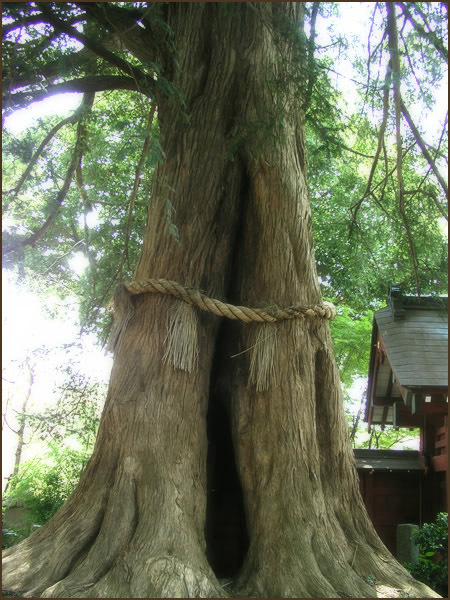 In other cases, certain specific trees may be linked in some way to the kami of the shrine, such as the shirushi no sugi at Kyoto's Fushimi Inari Shrine and the Ōmiwa Shrine, or the pines of the shrines Ōharano Jinja, Kitano Tenmangū and Sumiyoshi Taisha, the cryptomeria (nagi) of Kasuga Taisha and Kumano Taisha, the tataegi of the Suwa Taisha, and the "flying plum tree" (tobiume) at Dazaifu Tenmangū. Kannabi, kamunabi, iwasaka, himorogi and other names refer to a place in nature where the gods are believed to reside, a "purified place". It is also a kind of yorishiro resting place for the god.
. kannabi 神奈備 sacred forest . imiki, imi ki (imigi) 忌み木 "taboo tree"
. imi 忌み / 斎み / 禁忌 imi - taboo - Introduction . Sacred trees where deities come to reside during their travels in this world and the other. Forest workers, charcoal makers and local villagers found special trees in the forest that were not to be cut down, because 山の神 the Deity of the Mountain resides in them. Sometimes a 天狗 Tengu uses this tree to take a rest. It they were touched improperly, that person would hurt himself, get ill and eventually die. There are many legends of this kind of punishment of the Deity. 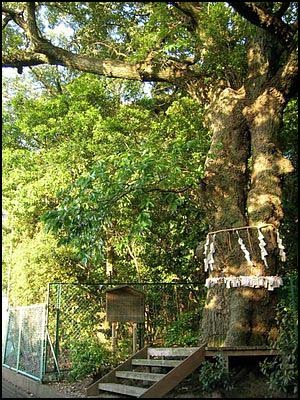 If for some special reason a taboo tree had to be cut down, there need to be a ritual first performed by a Shinto or Buddhist priest to ask for forgiveness and understanding. aioi matsu アイオイマツ（相生松）"mixed pine tree"
赤松と黒松 red and black pine tree grown together, in 幡多郡十和村 Towa village, Kochi.
. bifurcated pine tree and the Takasago legend . engi エンギ（縁木）"trees bound by fate"
The branches have the form of a broom. Often observed in mountain cherry trees 山桜 (hookizakura 箒桜), also called hotegi ホテギ. For example in 十和村 - 鏡村 Towa and Kagami village, Kochi. kasamatsu カサマツ（傘松） "umbrella pine tree"
The branches have the form of an umbrella. 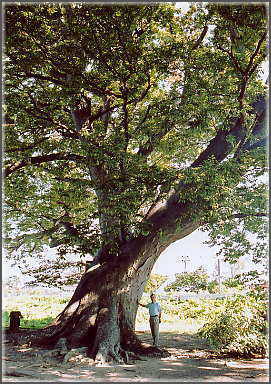 or 天狗の休み木 A tree where the Tengu take a rest.
. kuri no ki 栗の木 sweet chestnut tree . kusegi クセギ（癖木） "tree with a special habit"
A tree which grows in strange, unnatural ways. Some are quite elegant and tasteful. Trees with two stems, that parted at some point and were re-united further up again. Trees with this "window" opening facing east-west were especially auspicious.
. Aoki アオキ / 青木 Aucuba japonica, Japanese laurel . oyadakigi オヤダキギ（親抱き木）tree like a "parent embracing a child"
. 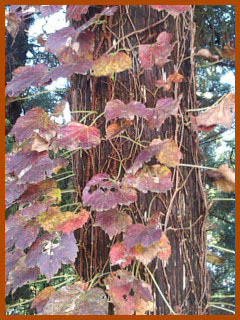 sakaki 榊 Sakaki tree, Cleyera japonica . In 北川村 Kitagawa village, Kochi. The stem is parted in the middle like a walking staff. In 香北町 Kahoku village, Kochi. Their legends are handed down in the villages. If someone tries to cut a tree town, he will be flipped in the air or falls under the tree. If villagers check in the morning, sometimes there is nothing special to be seen. Tree grown in the form of a Torii Shinto gate. In Yamanashi this tree is used by the Deity of the Mountain or a Tengu. Sometimes a tree falls down by itself. Villagers then cut some branches and ask the deities to enjoy them instead. tsurugi ツルギ / tsurigi ツリギ tree with two branches growing together 癒着. tsurugi, tsurugu means 交合 copulation in the local dialect of 池川町椿山、十和村 Towa village, Kochi. in 土佐山村 Tosayama village, Kochi. The branches look like 土瓶の取手 the handle of a dobin pot.
. WKD : ki, jumoku 木　－　樹木　.
. tachikibutsu 立木仏 trees with carved Buddha statues . This winter hokku is from the 10th month (November) of 1823, five months after Issa's wife Kiku died and two months before his ailing infant son Konzaburo will die. The hokku is about someone doing what is called "nailing a curse during the hour of the cow (1 a.m.-3 a.m.)." The most sacred time in Shinto is the middle of the night, when most of the important secret ceremonies are carried out, and curses were also popularly believed to be more powerful if made at that time, though they had nothing to do with Shinto. Those who made the curses, however, dressed in white pilgrim's robes, put candles on round holders on their heads, and wore other clothes as if they were doing austerities. The person making the curse secretly goes to a Shinto shrine between 1 and 3 a.m. night after night until s/he believes the curse is beginning to take effect. 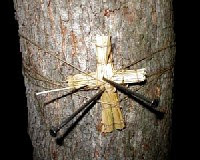 The curse itself is made by nailing a straw doll in the shape of the person being cursed to the trunk of a tree at a shrine with a long five-inch nail. Something owned by the person can also nailed to the tree. The "god's tree" here could refer to any tree within precincts of the shrine, although in some contexts it means the tree-body of a god. Since a tree embodying a god usually had a fence or sacred barrier around it and was hard to approach, I take this to be an ordinary shrine tree sacred to the god. In the hokku someone goes stealthily into the precincts of a Shinto shrine well after midnight and nails a straw doll to a shrine tree with a long iron nail, no doubt driving the nail through an area of the doll that would be fatal if actually driven through the person the doll represents. However, Issa evokes the tree responding to the nail as if to punish the person making the curse. The hard hammering shakes the tree and causes the nearly freezing raindrops still on its limbs after a day and evening of passing showers to fall down. Cold raindrops soak the nailer's head, perhaps putting out the candles s/he is wearing.
. Wara ningyoo 藁人形 straw dolls for curses . At midnight, a nail is hit through the heart of the doll to fix it to a tree in a shrine.
. karasu no ko 鴉の子 children of the crow, baby crow . scatters its pollen . . .
. WKD : sugi no kafun 杉の花粉 cedar pollen .
. WKD : nowaki 野分 "parting the fields" "field-dividing" wind, "field-divider" typhoon . are a group of islands in the southwestern part of the Sea of Japan and belong to Japan. Already under the Nara period the islands were used as an exile for persons from the mainland. From the Kamakura period the islands were administrated as "Oki no kuni" (Oki Province) and primarily governed by the shugo (governor) from Izumo Province. Under the Edo period the Tokugawa family took control over the islands and they were put under the direct control of the Shogun through a governor. Later they became part of the Matsue Domain. During that time the islands were a stopover point for trading boats traveling to and from Asia. get burned . . . Some shrines, especially the Grand Shrine at Ise, prepare special chopsticks from the divine trees for rituals or sell them as amulets to people.
. Ise Jinguu (伊勢神宮 Ise Jingu, Ise Grand Shrine .
. Masaoka Shiki 正岡子規 visiting Nikko 日光 . The tsuta vines are fond of old pine trees and like to grow around them.
. WKD : tsuta momiji 蔦紅葉 red leaves of Japanese ivy .
. Matsuo Basho in Nikko .
. bakko sugi バッコ杉 Bakko cedar of the youngest daughter . A tree with three main stems on the top of a mountain and a tree with two main stems near a swamp are sacred to Yamanokami. These trees are also sacred to Yamanokami in Ibaraki　茨城県.
. Suwa sama no shinboku 諏訪様の神木 sacred tree of the Suwa Deity . In the forest using trees for making charcoal, the biggest tree is 山の神さんの宿り木 sacred to the Yamanokami and never cut down. Once there was a sacred tree in the mountain forest. "Do not cut this tree! If you cut it your wife will have a severe accident!" He did not listen to this warning and cut the tree anyway. When he came home he found his wife on the kitchen floor with a deep cut wound in her leg.
. Yamanokami legends from Fukui .
. hoo no ki 朴の木 Magnolia hypoleuca tree .
. yadorigi 宿り木 in many villages .
. sugi no tatari 杉の祟り curse of the Japanese cedar tree .
. Yamanokami and Tengu trees .
. Yamanokami 山の神 - 榊 Sakaki tree . Sacred to Yamanokami. They may not be cut down to make charcoal.
. Yama no kami no tomarigi 山の神の泊木 . The 17th day of each month is the day of Yamanokami and the forest workers take a rest. If one cuts down a tree on that day, he will be cursed. Yamanokami is also inspecting the kikkabu キッカブ（木株 kikabu）stumps of the trees. If a human is in the forest, he will be counted and changed to a tree. A pine tree with wide branches is sacred to Yamanokami, where he comes to sid down 山の神様の腰かけ木. This tree is never to be cut down. A tree with two trunks or two branches from the same spot is sacred to Yamanokami and may not be cut down. A woodcutter once cut one tree down and later when he was home his house was shaking and the whole family was in great fear.
. enoki 榎木 / 榎 nettle tree .
. keyaki 欅 zelkova and fuji 藤 wisteria tree .
. shinboku no matsu 神木の松 sacred pine tree .
. Yamanokami no ki 山の神の木 The Tree of Yamanokami .
. 山の神さんの宿り木 - Fukushima . 三本立 and is venerated as a tree of Yamanokami to rest, tomarigi トマリギ. They are not allowed to cut it down. ...a person was seen hitting a nail into the sacred tree of the Inari Shrine to curse someone. He was bewitched by a fox.